A cancerous tumor develops when cells proliferate at an abnormally high rate and agglomerate in healthy tissue. Some of these cells are even more cunning. “Sometimes, cancer cells manage to leave the tumor to spread in the body, which complicates the evolution of the disease,” explained senior study investigator Jean-François Côté, Ph.D., director of the IRCM's Cytoskeletal Organization and Cell Migration Research Unit and professor at the University of Montreal. Metastatic cells move more easily than most of their peers—detaching from the tumor, entering the bloodstream, and reaching other organs, such as the lungs, bones, or the brain. Additionally, metastatic cells are more difficult to destroy as they spread to other parts of the body and are more resistant to current treatments—90% of breast cancer deaths are caused by metastases. Hence, one priority in oncology is to prevent tumor cells from spreading because this has the potential of saving many lives. The Canadian scientists have taken a step toward actually blocking metastases. In their study, the IRCM team demonstrated that a protein, AXL, influences the occurrence of metastasis in HER2+ cancer, an aggressive type that accounts for 20% of breast cancers. 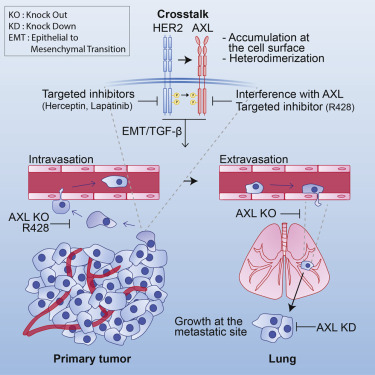 In HER2+ breast cancers, cells with elevated levels of AXL are more likely to detach from tumors to form metastases. The research was performed on mice and with samples of tumor cells taken from cancer patients in Montreal. Statistical indicators about patients are also encouraging. In women with HER2+ cancer, it was found that the less AXL is present, the better the survival rate. Previously, researchers had linked the AXL protein to another type of cancer, triple-negative breast cancer, but no one had examined its presence in HER2+ cancer prior to the current study. “Based on this discovery, a treatment targeting AXL could reduce the risk of metastasis,” Dr. Côté remarked. Interestingly, it has already been shown that the action of AXL can be hindered. The IRCM researchers administered an AXL-inhibiting drug therapy to mice with HER2+ tumors and found that metastases were less prone to develop. The drug is currently being tested in clinical trials for various therapeutic uses. If subsequent studies are as successful, this treatment could also be used to treat breast cancer patients. It would act as a complement to therapies targeting the HER2+ tumor. “At the moment, we are checking whether the tumor’s environment, such as blood vessels and the immune system, is affected when AXL is inhibited,” Dr. Côté concluded. By getting a better picture of the phenomenon, it will be one more step toward treating the disease.